Legendary magician Harry Lorayne is now in his 90s, and is still producing quality books on card magic. He recently published yet another book filled with wonderful material, entitled Jaw Droppers Two!. And he's currently finalizing the publication of his latest book, which is entitled And Finally!, and looks like it might actually be his final book. If the man decides to put away his writing pen, you can hardly blame him. He was born in 1926, and has outlived virtually all his contemporaries in magic. He's sold literally millions of books, including best-sellers like The Magic Book (1977) and Close-Up Card Magic (1962), both of which are still highly regarded and often recommended by magicians today. A true entertainer and top showman of his time, Mr Lorayne has a remarkable track record throughout his career in magic, and in his written work he has made a prolific and lasting contribution to the art of card magic. Even though much of his written work dates back to previous decades, the books on card magic that Harry Lorayne has written have stood the test of time. Besides being a wonderful entertainer that has provided memorable entertainment to thousands of audiences across the world, he is especially appreciated for his contributions in teaching magic. His books have a unique ability speak to speak to modern audiences just as they did to the previous generation. He is a very clear writer, with a remarkable ability to explain things in words like very few others can. And along with that, he is also a thinker and creator, and is constantly coming up with new ideas and ways to improve old routines. That's why he decided to embark on a project that would reproduce his best work under the title The Classic Collection, and was published over a ten year span from 2005 to 2014. This is a series of five titles, each of which compiles together several works that he authored, complete with Harry's own "Re-Write, Additions, Decisions, Revisions, Upgrading and Updating". Bound together in five high quality hard cover volumes, and available from Harry himself, these fine books make a definitive statement of quality both inside and out. In this article I'll introduce you to this series, what they're about, and some reflections on them. So how did these volumes come about in the first place, given that these effectively republish existing works? Harry explains in the preface of one of the volumes that he'd long wanted to re-write the books from previous decades in order to update and upgrade them, and add to them with some new ideas, without taking away from the originality of the original books. He also wanted to include multiple books in a single volume. Part of this is because he realizes that he was able to write better and teach effects/routines in a more clear way. It's also worth mentioning that some of the original books are long out of print and unavailable independently, so this is a great way of making them readily available - in an improved form. Not all the original books had accompanying photographs, so that's another upgrade. It was a significant undertaking and a lot of work, since Harry didn't just want to reproduce what had appeared previously, but ensure that these were actual improvements on the originals - which they were. And so despite the fact that many people had the original volumes, the series still proved to be very popular. Volume 1 sold more copies than expected, even needing to be reprinted at one stage, and that inevitably also led to a demand for further volumes. In addition it includes his 1976 manuscript The Epitome Location, which covers a method to find a missing card in the deck by totaling the values of remaining 51 cards - which amongst other things is a very helpful "out" if you need to identify a selected card removed from the deck. In the course of Volume 1 Harry also includes 16 new effects and routines. Unfortunately this volume is out of print and not readily available, unless you're lucky enough to find it on the secondary market. Reputation Makers includes classic Lorayne routines like The Card Sharp & The Four Gamblers, Snap! and Instant Magic Square. With Rim Shots you get to learn Status Quo Shuffle, The HaLo Cut & routines, and Amazing Prediction, while Afterthoughts includes The Ultra Move, Easy Indicator, Goin' Fishin', and Snappy Flush. As bonus material, this volume includes Harry's famous routine "Numero Uno", and his 1972 manuscript The Great Divide which explains a colour separation of an entire deck into reds and blacks. Popular routines from Quantum Leaps include An Amazing Revelation Display, The Best Gosh Darn Impromptu Linking Card, Overhand Run Finesse, Manipulative Aces, and The Super Peek, while Trend Setters includes Pop-Up Ace Pyramid, The Equalizer, Universal Reversal, Instantly Wired, and Near Perfect; with Dingle's Deceptions you get to learn The Int’l Coin Trick, Color Triumphant, and Four Coins In The Countin’. 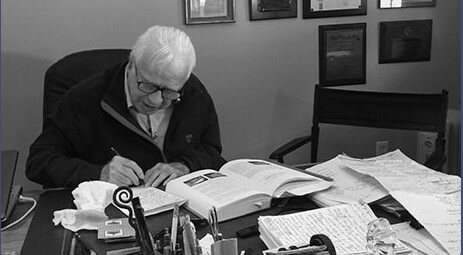 It's worth mentioning something about the manner and style in which Harry writes books, which he discusses in the interview he had with Rudy Tinoco on the occasion of his 90th birthday. Most of his books are divided several sections or chapters, each containing about a dozen tricks or utility moves. There is typically a Foreword at the beginning of each book, and sometimes a Last Word at the end. Although some tricks are grouped together, often if they are linked by using the same move (e.g. the HaLo Cut or the Ultra Move), there's no special categorization of the tricks as such. Harry typically puts together his collection of tricks somewhat by a stream of consciousness technique, including things as they came to mind and while he writes the book. Even so I'm glad that there are separate sections and chapters, which helps break up the material somewhat, and makes it easier to find material, and to read and study the content. 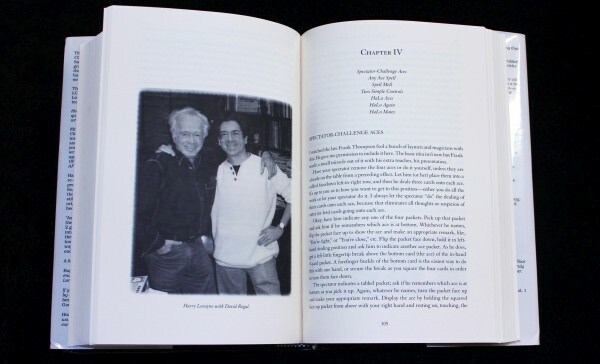 While Harry writes and types up his books himself, for the final polished product he does engage the help of some professionals with expertise in photography (Matthew Potter), and layout and design (Andrew Pinard). With their assistance, we get to the final book, which is published under his own company name, Harry Lorayne Inc.
Each volume in this wonderful series exudes quality the moment you first hold it in your hands. 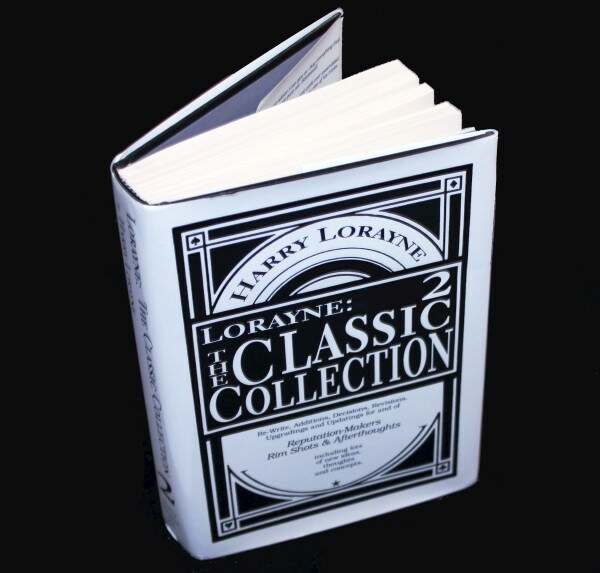 Like most of his books that are published under his own Harry Lorayne Inc publishing brand, it is a quality hard cover book with embossed white lettering on the spine. The simple colour scheme makes everything look very classy and elegant, and also gives it a tone of complete seriousness. In other words, this is a worthy set of covers for the secrets of card magic that await discovery within, and is exactly how a book of magic secrets should look! An attractive dust cover with a bold and minimalist black and white design completes the presentation. Even that breathes quality, being made out of a glossy paper stock, with the inside jackets full of endorsements for Harry Lorayne and testimonials for his books. Once we open the book, our initial impression of quality is only confirmed. Each book consists of around 400-500 pages, so you are instantly greeted with a massive amount of material. No shortcuts have been taken on the paper quality, which has the look and feel of what an important volume like this deserves. The binding is especially superb, and it is a real joy to page through the book, knowing that it won't fall apart, and that like Harry's magic, this is a book that is designed to go the distance. Harry Lorayne would be the first to remind us that "they don't make them like they use to" and that "you need to start reading the good stuff". With this book he practices what he preaches, because he's produced something that not only has lasting content, but comes in a durable package that itself oozes class and style. It's the kind of book that you can expect to use over and over, and hopefully one day pass it on as an heirloom and treasure to a budding young magician. The layout and formatting impresses as well. Sandwiched between a "Fore-word" and "After-word" from Harry himself are seven separate sections, each covering about a dozen tricks or utility moves. 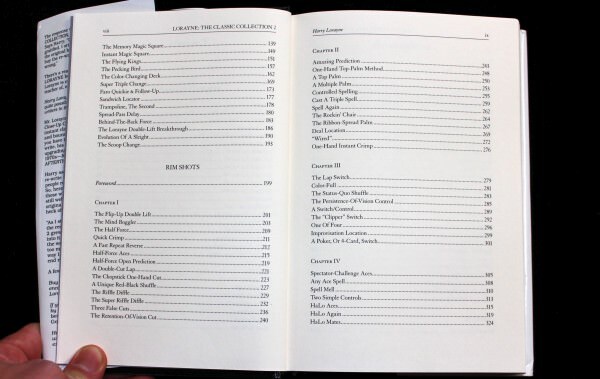 A comprehensive Table of Contents at the beginning of the book gives a good overview of the material in all three books, listing each trick by name along with the page number where it can be found, making it easy to come back to our favourite routines. 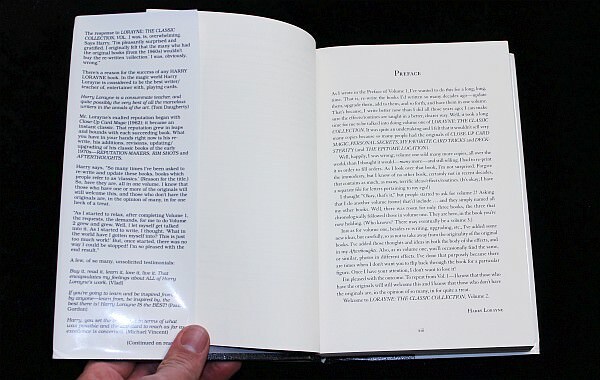 No space has been wasted, and the only real white space occurs in the occasional breaks between sections or chapters. The top of each page also helpfully includes the title of the book that we're currently looking at. The text is accompanied by literally hundreds of illustrative photographs, and there are one or two on almost every page. These are well placed alongside the body of the explanation, and provide that essential visual that at times helps you understand the text better. Each trick is marked as a heading in capital letters, to separate it clearly from the preceding material, and making it easy to find where the explanation of a particular routine begins. The description for each trick typically begins with a brief introduction about its origin or background, after which Harry goes straight into the performance and method. His explanations make for very easy reading, and it's just as if you're in the same room with him, listening to him talk to you about what to do. From time to time he also suggests appropriate patter. He employs a very conversational style, and his clarity of communication is one of his real gifts for which he has often been applauded as a teacher of magic. Following each trick Harry often concludes with some helpful "Afterthoughts" that offer further reflection, including further ideas or comments that go beyond the explanation of how to perform the trick itself. There's an excellent range of material in this series, and not only are there tricks and some utility moves, but the tricks themselves also include a variety of methods and effects. Harry Lorayne has always been a big proponent of impromptu magic, and that is also very evident. The advantage is obvious: give him a borrowed and shuffled deck of cards, and he can do his wizardry. That doesn't mean that no tricks use a set-up, of course, but often this can be done on the fly, in the course of a preceding trick. Do any tricks in particular stand out? Well there's a whole lot of strong material here, and if we were to ask Harry which ones are the best, he would of course normally say "all of them!" These are books that one really needs to spend several months studying carefully to really do justice to them, and I feel like I've only scratched the surface of the one volume that I've especially spent time with. The good news is that these books are really the culmination of a successful career in card magic, and as a result they contain many proven classics and gems that are well worth the trouble to learn. Many of the utility moves that Harry explains and teaches are also tremendously useful, and have a wide application. It's hard to pick which of the five volumes is best, although Harry's personal favourite is Volume 2, given the strong material it contains. Volume 1 has appeal because it includes the excellent Close Up Card Magic, which is a classic. For people starting out, Volume 4 is a good choice given that it has The Magic Book. It's possible that many younger magicians are relatively unfamiliar with Harry Lorayne, since what typically tends to receive the focus of marketing in the magic industry are the latest and newest effects that are released, to drive their sales. But those new to magic should not make the mistake of ignoring the greats of the past, particularly those who have left a lasting legacy, and who are the giants on whose shoulders that modern creators stand. In Harry's case, he's still in the process of defining his legacy with new contributions like this book, but younger and new magicians do well to consider the breadth and body of his life's work in teaching card magic. Much of his work has a timeless feel, and can produce miracles today just as it always has. According to Darwin Ortiz in his book Designing Miracles, truly effective magic requires skill in several areas, namely 1. good magic design, 2. good technique with cards, and finally 3. good presentation. Harry Lorayne excels in all these areas. Particularly his skill in showmanship is worthy of note, and throughout his career he has had the ability to entertain like few of his peers. But he's not just a good showman and skilled card handler, but also a strong creator. This is a solid collection of tricks that show evidence of good design and crafting, and have proven their enduring value in Harry's own career in magic. So what you get from Harry Lorayne is high calibre content, and also tends to be very practical and usable. But in addition to the above mentioned talents, Mr Lorayne has one more: the ability to write and to teach. He's also highly regarded in the field of memorization, as a leading expert and educator. But it's not just his influential books on memorization techniques that are well written, but the same can be said of his books on card magic. These are clearly written, and in a conversational style that makes pleasant reading. It's no secret that Harry Lorayne is widely considered to be one of the very best writers and teachers in the history of magic. That's a massive accolade, because it's not just me saying this, but you'll hear this repeated often by many magicians. Especially when it comes to teaching with the written word, being both clear and concise requires a real gift that few have. Without entering into a debate as to who is the greatest at this, Harry is certainly and indisputably one of the all time greats, and this series certainly displays that unique ability. Many magicians will testify that although they are not accomplished performers, due to Harry's clear and concise explanations, his material is well within their ability to learn and perform. He has a rare talent in communication, that enables him to make the complex become comprehensible, and even turn it into something straight-forward and accessible. 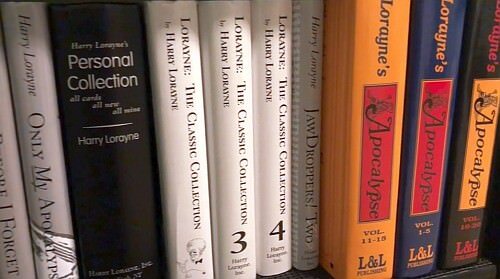 Readers may also want to consider getting some of Harry Lorayne's Best Ever videos, which make a wonderful teaching companion to these books. Sometimes a picture is worth a thousand words, and the content in these videos matches much of the material in these books. Plus those who are unfamiliar with Harry Lorayne really shouldn't get to know him from his written work alone, since his energetic performing style and unique charisma really is a must see. 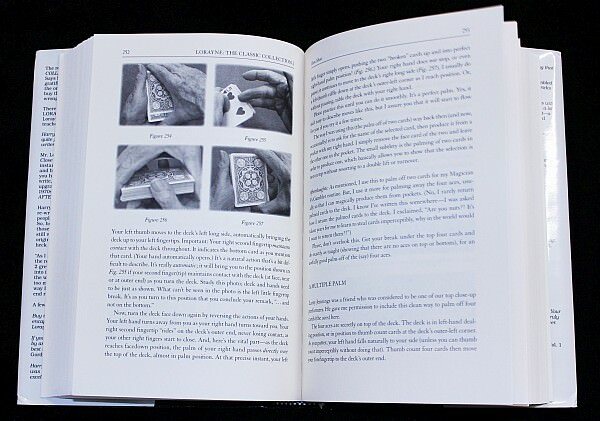 Many of Harry Lorayne's teaching materials are very accessible to beginning and intermediate magicians, which is one reason why his books The Magic Book and Close-Up Card Magic have proved foundational material that has been used by many to start a career in magic. Harry himself is a gifted magician that attained a high level of technical skill, and his mastery in handling cards is not going to be easily matched by most of his readers, most of whom will be intermediate level magicians at best. Even so, most of his routines have handlings that are well within the scope of the intermediate magician, and aren't knuckle-busting or impossible for the average person to master. So it's good news to discover that these tricks aren't just within the reach of the advanced magician with expert technical skills, but much of this material is very practical and accessible for the average magician. For someone like me (an amateur, with an intermediate ability), that's welcome news, and it also means that The Classic Collection is going to be of benefit to many more than merely those who inhabit the upper echelons of advanced card magic. There's also material that is geared entirely to beginners, such as The Magic Book which is contained in Volume 4. But for most of the content, a basic ability with standard card sleights is almost essential, since the majority of tricks assume intermediate skills with cards, such as an ability to control cards within a deck while shuffling, as well as standard sleights. At most I only have minor criticisms, one being that I would have liked to see an alphabetical index at the back of the book, which listed all the tricks in that particular volume, and serving as a quick reference. Something also needs to be mentioned about the price, since these books will set you back around a hundred dollars each. But take a look in your magic drawer and see how many DVDs or gimmicks that cost you $30 each are collecting dust. It's important not to judge this book by its price tag but rather by its value, and it's obvious to me that it delivers an enormous amount of quality content. The price isn't cheap, but given everything you get, the value is going to be far better than most magic purchases you'll ever make. It's rare that anyone purchasing any of Harry's books feels that they've paid too much, given the large amount of "gold" that can be found within the pages of any of his written works. That's more true than ever with the Classic Collection, given the multiple works that lie between the covers of each volume. Fortunately for us, Harry Lorayne is still around to smell the roses when we send praise in his direction, and we're still able to give him our personal thanks for monumental works like these. But the day will come when he himself will have left us, and at that point we'll have to rely on the lasting legacy of his written work. For now, we can give him thanks for producing this wonderful series of books, which will undoubtedly ensure that he will be long remembered, and that his prodigious output will continue to have a lasting impact on card magic even in the decades to come. 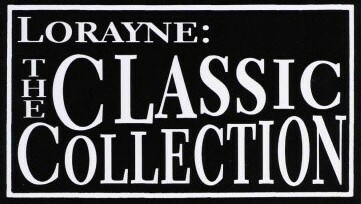 The Classic Collection is a series of terrific books that ooze class and quality in every respect. I'm also so pleased that the physical quality of these book (paper, binding, cover, formatting etc) matches the quality of their content; these are beautiful volumes that give the wonderful material inside the royal treatment they deserves. I'm very much enjoying paging through the current volume that is within easy reach, reading bits and pieces, and I look forward to continuing to explore it in years to come. This classy series can be highly recommended, and I consider myself privileged to be able to learn from the pages of Harry Lorayne's books. Thank you Mr Harry Lorayne, consider this to be another bouquet of roses heading your way! Want to learn more? 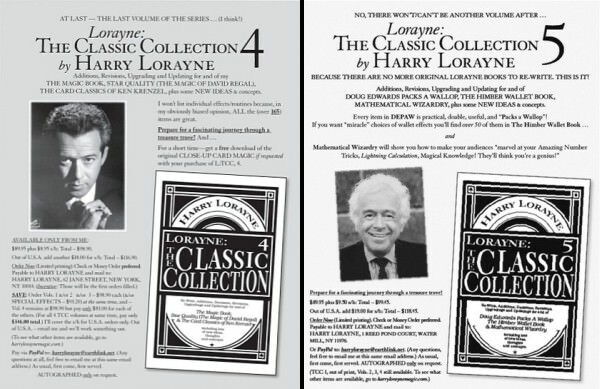 The volumes of the Classic Collection are available directly from Harry Lorayne (autographed upon request) via his online web-store.